Since I know the holidays are going to be busy, I am getting into the “new year, new me” mentality a bit early. 2018 was an interesting year. Flights to Michigan and the Philippines for family ate my vacation days, so I traded my random weekend domestic flights for road trips like Austin and Houston. It’s made me really miss my friends and exploring new places, but it’s also helped me focus in on my side hustle. Now let’s see if I met my 2018 goals! Card Collections: I didn’t make any full collections, but I did make a few new designs this year. I tracked down my favorite paper and started printing at home. The process is a lot slower so I only made enough to sell in person. I will do better! New Product Types: I now offer stickers, art prints, and pouches! I have been dragging my feet on my enamel pin tags, but hopefully they will drop in 2019! Wholesale: The numbers and terms are in my head and in my notes, but the actual catalog doesn’t exist yet. Definitely going to keep this goal for 2019. Website: No revamp yet, but still on my short list, especially after Etsy’s fee changes. Womp womp. I set these goals not realizing the everyday upkeep my shop was going to need, so some of them were definitely swept under the rug. On the bright side, I grew my business in ways I didn’t expect! Looking back at my 2017 wrap up post, I was at 100 sales and 400 Instagram followers. This year I am at 380 sales and 1700 followers! I know numbers are not everything, but they are definitely motivating. Getting into the pin game has really supercharged my shop, and staying home has saved me a lot more energy to maintain it! I even started to do in person events, like the Dallas Pin & Patch Show and Decent Market. This was a gigantic step for me, and I definitely want to do a bunch more in 2019. Oops. My scrapbook is pretty much in the same place as it was a year ago. I blamed it on my crowded workspace, and I still do! Luckily that space is about to change, and I would love to make room for this mood-boosting hobby. I do still take photos (because of course) and I have been mega engaged on Instagram. 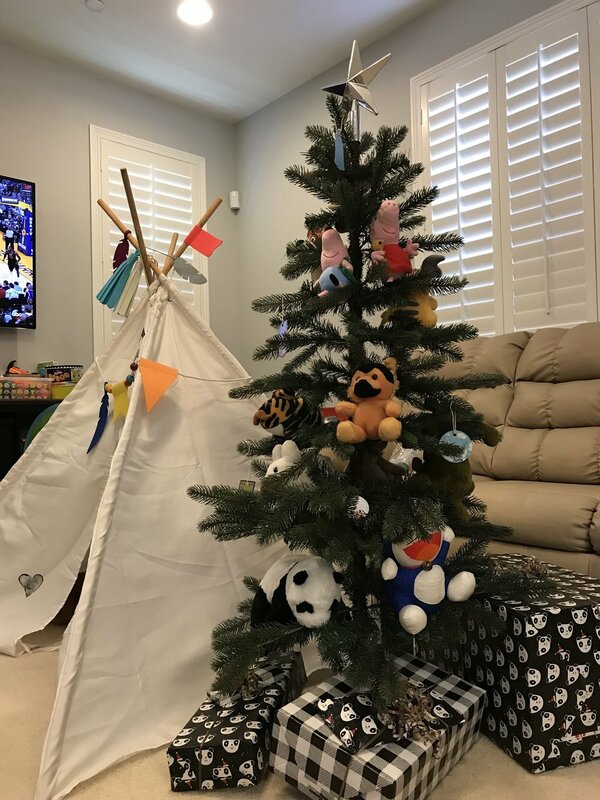 Remembering the little things is important to me, and I plan to continue that in 2019 through photos, scrapbooking, blogging, vlogging, and more! Speaking of vlogging, I started a studio vlog this year! Of course, I fell off the wagon right away because I’m just way too bashful. I am going to try to continue in 2019, because I have a lot of big things happening..
Last year I also mentioned painting - I did end up buying acrylic gouache, but can’t bring myself to learn it. I still love my iPad. No change there! I think 2019 is going to be really exciting! I’ve already got more “for fun” trips planned than I had this year. I’m also going to be moving into my very first house, and I think it’s going to inspire me a lot! It’s gigantic and full of projects and natural light - literally my favorite. I can’t wait to share! Winter 2017 Products and Last Call for Christmas Shipping! It's 2018 already! As busy as we all get, I think it's still important to reflect on the past year - 2017 was a huge one for me. I️ started a job where I️ actually get to design full time, made my first out-of-state move from Michigan to Texas, and made a legitimate commitment to my side hustle! I️ also traveled a LOT this year. I️ went to Las Vegas 3 times, New York City twice, Disneyland, LA, San Diego, Seattle, Vancouver, Chicago, Houston, Antelope Canyon, Phoenix, Connecticut...whew! 2017 was such a fun one for my business. I’ve just gone over 100 sales, 3700 digital downloads, as well as 400 Instagram followers! PS I’m celebrating with a big sale and giveaway - details are here. You know I finally started scrapbooking in 2016 and filled two albums, so I️ really wanted to continue in 2017. My 2016 layouts were slow and more cluttered than I️ preferred, but I️ knew that only practice could ease me into my own style. For 2017 I️ streamlined my process by implementing more templates and white space. It really saves time and I️ am happier with the look too. I️ am still behind because I️ haven’t gotten the hang of my smaller workspace, but I’m definitely still going! I️ love actually using my photos for something, and looking through my scrapbooks reminds me to appreciate everything I️ do and have. Every year I️ want to experiment with painting. I️t’s so hard for me to create in loose mediums - I’m so attached to vector flexibility and the glorious undo button. I️ hear acrylic gouache is easier for illustrators to pick up, so I️ wanted to a buy a few colors and explore within one color palette - I’m still not ready to jump in, though! Thankfully, I️ got an iPad Pro this year and it does help scratch my traditional media itch. If you are thinking about it, I️ highly highly highly recommend it. I️t has made creating sooooooooo much easier for me, even though I️ already had a small Wacom tablet. I know this is dramatic, but without my iPad Pro, I absolutely would not have survived work or released as many products I️ did this year. Christmas has been the only time I️’ve released a definitive collection in the past, but I’d like to do more of that, whether it is by holiday or by season. I️’ve already soft released Valentines 2018 cards, so go check those out! I’ve always imagined a whole suite of products for my shop, but started with cards to test the waters. Now that I’ve successfully produced pins, I️ am definitely looking to add more product types. I️ will be looking to make some new stuff happen this year! Starting off with 7 pin designs was a huge commitment, but I’m glad to have all of them. I️ want to make a million more designs, but I️ know I️ have to control myself! 2018 will definitely see new pin designs. I️ may even crowdfund a few so that I️ can make more designs or produce them sooner. Let me know if there is anything specific you would love to see pinned! Wholesale has been on my radar for years, and I️ have always made my products with that in mind. I️ am finalizing some plans, but should be able to launch in 2018. I️’m super excited and cannot wait for the day. I️ plan to give my website a new layout, including a shop! Etsy has been working all right, but I️ would really like my own storefront as well. I’ll still be blogging on the site and offering freebies, so make sure to come back and visit. This is my first winter in a warm climate, so it doesn’t really feel like January to me, but I️ am so thankful that there’s no ice to break my leg on anymore. Here's to 2018! I realized I️ never posted about my new Winter 2017 products, but I️ will now in case you are still [or just now] thinking about holiday cards and stocking stuffers! I️ cannot guarantee any dates, but according to the USPS guidelines, the recommended send-by date for delivery by Christmas Eve within the contiguous United States is December 19, which means please submit all of your orders to me by the end of this Sunday, December 17th! First up is cards! I have 3 new holiday cards this year, along with 3 past holiday designs. My box sets of 10 are now sold out for the holiday season, but you can still get them as singles, or new sets of 6. In case you want to mix things up, I've also done an early release for my 2019 Valentine's cards, which you can include in your custom box sets too. Now for the REALLY exciting part - enamel pins! These are a brand new product to my shop - I️ have been admiring trendy pin designs for years, and finally gathered up the courage to make some of my own. 7 designs, to be exact. It was a long and suspenseful process, but so worth it! Eat your heart out! Taco Suave has arrived - go ahead and try to resist his charm and sour cream coif! He has a buddy card in the shop, too. 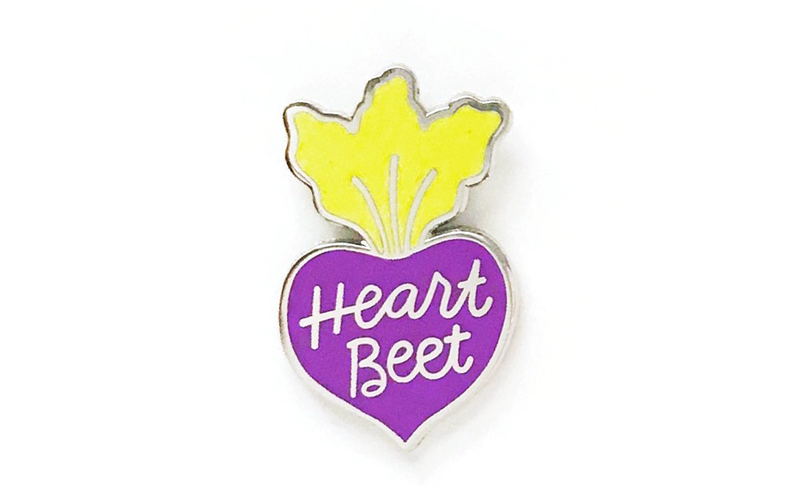 Pin this beet on your lapel and show ‘em where your heart beets! Check out the card too, perfect for your SO. Let this little great tiger be a reminder that you’re great! Pair him with the coordinating card to make someone’s day. 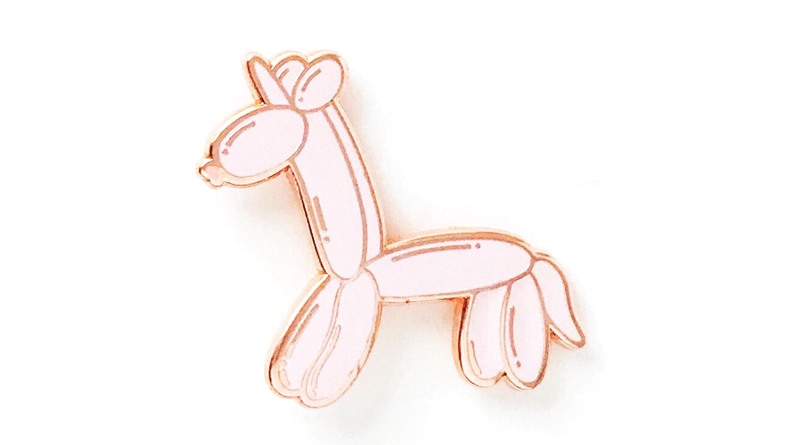 It’s a balloon animal, it’s a unicorn, it’s a balloonicorn! I’ll have a coordinating card for this guy in my next run. Last but not least are these origami animal enamel pins (enanimals?)! You can pick them up individually (crane, bunny, bear), or as a discounted set of 3. I️ already cannot wait to make more! Enamel pins feel like the perfect medium for my illustration style, and it’s so satisfying to see them come alive. I️ have also been busy buying and trading pins to build a collection of friends for my pins - let me know your favorite pin designers or if you make them too! My October has been packed with travel! This time I went to Las Vegas, but spent most of the trip at Antelope Canyon. It's definitely worth the 5 hour trek - Horseshoe Bend is only 10 minutes from it, too. The 1000 foot drop at the bend is PETRIFYING though..
Once I got home, it was time to get my Halloween on! Here's a bathroom pic of my DIY sushi costume! Salmon nigiri is totally my spirit animal. I made these cuties for a work party! The ghosts got a little charred, but I think my macarons are nearly where I want them to be. I've been making them on and off for 5 years, and have never been able to get rid of the hollows. I'm so, so close! I was forced to put on Yankees gear and go down to Houston for NLCS Playoff Game 6. Even though they lost, it was fun - and the Detroiter in me didn't mind seeing Justin Verlander do well. The first time I went to Houston, I didn't get to see Waterwall Park, but better late than never! This photo doesn't do it justice, but it's definitely worth a visit. Dear Subscribers: I know I've only posted about free journal cards for a long while, but mixed content is coming. You will still only get 1 email max per week, but if you are interested in seeing my digital downloads and absolutely nothing else, go ahead and unsubscribe to my emails and head to my Gumroad shop and click "Follow" there instead.